Russell Malone on learning from his heroes. 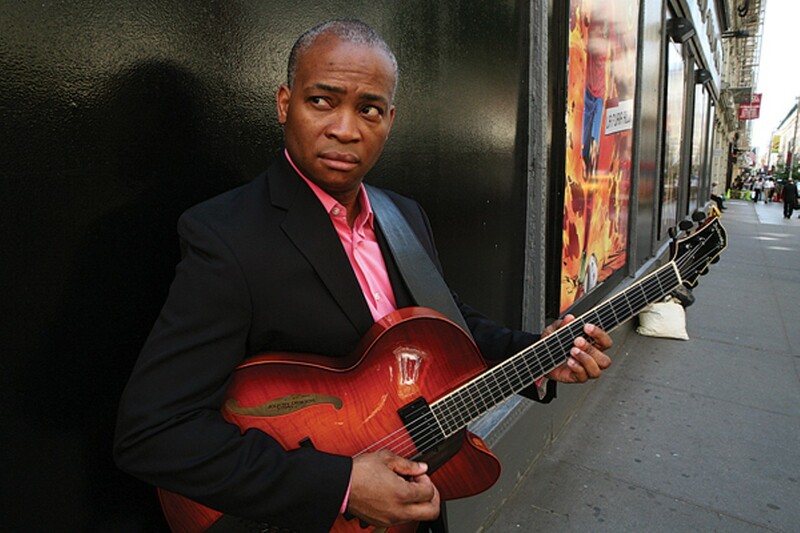 Jazz guitarist Russell Malone taught himself to play guitar. He went on to play with Jimmy Smith, Ron Carter, Diana Krall, and others. We spoke about influences and mentors and facing up to the greats. Malone will play at the Germantown Performing Arts Center on Saturday, March 22nd. What music did you hear growing up? The Dixie Humming Birds' guitarist, Howard Carroll. He was very prominent in that band. Then there was Leroy Crume in the Soul Stirrers, another of the groups I was doing my best to try to pick up some of the riffs that they were doing. You used to be able to turn on the television and see musicians playing instruments. I remember seeing Chet Atkins playing guitar on television when I was a kid. And there was Merle Travis. Glen Campbell had a show called the Glen Campbell Goodtime Hour. I'm sure you know that Glen Campbell was a formidable guitar player in his own right. But a turning point for me was when I saw B.B. King performing on television. That was an epiphany. I had never heard the guitar played quite like that. And the way he sang was so similar to the way the minister in my church would deliver a sermon. You saw George Benson and Benny Goodman on TV as a kid and later said it changed your life. Once I saw that, I knew there was a whole different level of guitar playing that I wasn't aware of. I made a mental note of the name George Benson. During that time, I had a job raking leaves in my neighborhood. We'd rake yards for five dollars. At the end of the day, you'd rake five yards and put $25 in your pocket. You could get some things done in 1975, as a 12-year-old kid. One of the first things I went out and bought — I bought two records — The George Benson Cookbook and Uptown. They were $2.99. There was a gentleman in my church who saw the direction I was going. So he turned me on to two records that I still listen to today for inspiration: two Wes Montgomery records, Smokin' at the Half Note and Boss Guitar. So that was my introduction to jazz guitar. He was playing with such fire. It was clean. It was precise. And I didn't know what soulful was back then. Looking back, it was definitely some soulful guitar playing. So what I did was spend time in the library and read up on jazz. How does a kid go from the library to jumping onstage with Jimmy Smith? That's quite a leap. I played with the local guys in my hometown of Albany, Georgia. Then I ended up in Atlanta. That's where I met Jimmy Smith. I was playing a gig at the Holiday Inn Crowne Plaza and heard that Jimmy Smith was going to be in town that week at a place called Castles and Carousels. That was the buzz in the city. So the drummer in my band and I drove down to see Jimmy. He was everything that I expected and then some. He had this way about him. This charisma. So one of the local musicians who was playing with him introduced him to me. Jimmy looked me up and down and said, 'Go get your guitar.' So I sat in on a track or two. I tried to play a few tunes with him. It was a humbling experience. But I ended up working with him for two years after that. Tell me about Mulgrew Miller. Oh my goodness! I met Mulgrew that same year in Atlanta. Mulgrew came in with the guys from his trio. He was very personable. He had this way about him that made you want to love him. He was modest. We became friends and did a lot of work together. We traveled the world with Ron Carter. He was one of my mentors and my brother. I've been so fortunate. I've been in the presence of a lot of my heroes. Ron Carter is someone I had wanted to play with since I was 12-years-old. When I first started getting into jazz guitar, I was listening to Wes Montgomery and George Benson. While I was focusing on the guitarists, who were the leaders on the records, there was something about the bass player. Ron's presence and personality were so strong on those records that it made you want to listen to what he was doing. Then I started listening to the Miles Davis records. And I was thinking that Herbie Hancock, with all of his harmonic knowledge and awareness, that he was the one dictating where the harmony goes. And that's true to a certain degree. But having played with Ron Carter, I strongly believe that he was the catalyst for the harmonic direction of that band.